2013-12-24 We are currently working on our fullenght album. We expect it to be released in 2014. For further information visit us on facebook. 2010-04-18 We are back from Immortal Metal Fest 2010. It is with great thankfullness we looking back at a awesome weekend. A big Thank's to all the amazing organizers, visitors and great bands. You showed us a high level of quality. Once again, THANK YOU Immortal Metal Fest 2010! 2009-05-26 We are back after a great weekend in Germany, we really enjoyed every minute of our visit. A special thanks to the awesome HRH-crew, you did a awesome job and we hope to see you soon agian. Also a big thank to all who showed up and supportet us during our gig. If you have pictures from our gig you want to share with us. Send us a email! Thanks again! 2009-04-25 We will performe live in Germany May 23 2009 at Hardrock Halleljua Festival togheter with the awesome Fallen Walls. We are really looking forward to it and hope to se you all in the crowd. You will find more info at Hardrock Halleluja. 2009-04-25 We want to say thanks to all of you who showed up and supported us at Immortal Metal Fest. A special thanks to the entire IMF-crew, Elias on drums and Mikko on bas. Thanks for the great job you did. We enjoyed every minute in Finland. We hope to see you soon again! If you have pictures from our gig you want to share with us. Send us a email! Thanks again! 2009-01-30 We are back after a great weekend in Denmark. The GLDF was awesome, take a look at some live pictures in the picturesection. Stay Cold friends! 2008-12-11 We are going to play at Immortal Metal Fest, 19 April 2009. Other bands will be: Seventh Avenue from Germany and Deuteronomium from Finland. More info at Immortal Metal Fest 2009. See you all there! 2008-10-22 We are going to play at GreenLight District Festival in Denmark, 23 janury 2009. Other bands will be: Impending Doom (us), Sacrificium (d) and some more great bands. Greenlight District Myspace. 2008-07-20 we are back from a great weekend in Kramfors. We enjoyed every minute of our visitation and would like to send our biggest thanks to all the people in the crowd (old and new fans) and the Jesusrock crew. We will let you know if there is any picture available from our gig. 2008-04-06 Admonish recently added a new track on myspace, it´s a mix of three old songs and we hope you enjoy it. Check it out: Admonish Myspace. We´re also being booked for a festival called Jesusrock. More info in the gig section. 2007-11-29 Our perform at "Spinnrocken 2007" is done, it´s always great to meet the crowd. Posted some pictures from the show in the picture section. Thanks alot to Emile Mangematin for cool pictures. If you have pictures from the gig you are welcome to share them with us. Soon you probably find some pictures at Spinnrocken 2007. Enjoy! 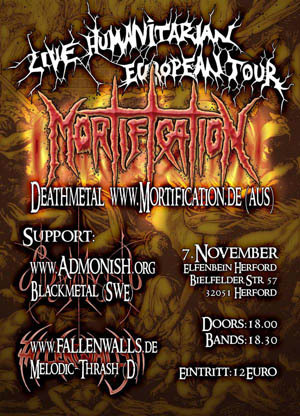 2007-11-20 We´re back from Germany and the gig with Mortification and Fallen Walls. A big thanks to the crew for their excellent work. Thanks to the hostess for open up your house to us. Also a big thank to the bands for great performing and all visitors who suppored us during our gig! Pictures will be posted as soon as we have them! If you have pictures from our gig you are welcome to share them with us! We will also perform at "Spinnrocken 2007" in a few days. A yearly musiccompetition who take place in Huddinge/Stockholm. For more info, go to the official site for Spinnrocken 2007. 2007-10-27 We hope to see all of you in Germany. You could find more info about the concert at the Mortification concert page. 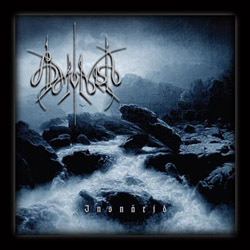 2007-08-03 Admonish will perform live in Järpen, 1th September! More info at the Festivalpage. See you! 2007-05-03 Our new t-shirt (influenced by the inside artwork of the "Insnärjd" Ep) is available in the merchandise section, take a look and buy one today! Cheers! 2007-04-28 Livepictures from Elements of Rock in the media section. Visit Ghâshûl.dk for more festival pictures. Enjoy! 2007-04-25 We´re back from Switzerland and the Elements of Rock festival. A big thank to the festivalcrew for the best service and reception during the whole festival. Also a big thank to all bands for great performing and all visitors who suppored us during our gig (you are the best)! Pictures will be posted in a couple of days, so stay tuned and stay true! 2007-03-06 Lyrics from our new Ep "Insnärjd" is available in the media section. 2007-02-02 Admonish are very happy to announce that we've been booked for Elements of Rock in Switzerland in April 20 - 22th. It will be a Must-Go-event for all metal fans. See you there! Our new EP "INSNÄRJD" (Entangled, ensnared) will be released tonight at Metalnight in Allingsås. Strictly limited to only 850x with 8 Page 5 Colour Silver Booklet. This release will sell FAST so be sure to get your copy while they last! 2006-12-09 New Admonish EP out now! The new EP, "INSNÄRJD" (Entangled, ensnared) features a wide span of sounds, from furious black metal storms to the melodic whispers of the winter night. Strictly limited to only 850x with 8 Page 5 Colour Silver Booklet. This release will sell FAST so be sure to get your copy while they last! 2006-11-06 Posted some livepictures from our gig at Nordic Fest in the pictures section. More pictures will be posted in a couple of days. Keep your eyes open! 2006-10-05 Emil and Jonas was interviewd by RixFM this morning. It´s the biggest radio channel in Sweden whit over 1 million listeners. The interview is available in the media section. They also did an interview whit the hardrock channel "Bandit" who will be on air during the next week. Stay tuned! 2006-09-20 Emil and Jonas and their pimped metalcar will be at P5 Radio Stockholm. Thursday 21th September (tomorrow) 7.40 (local time). Dont miss it for the world. 2006-09-16 Emil and Jonas of Admonish will be a part of the new season of MTV:s Pimp My Ride International 2006. Make sure to watch them getting their piece of junk pimped by the king of crunk Mr Lil´Jon. The episode will be on worldwide broadcast during October (6th October in Sweden). 2006-09-14 Posted some new pictuers in the picture section. Check them out. 2006-09-14 Now you can visit and write the Admonish guestbook. 2005-08-18 Epiphany (full song) is available for download in the music section. 2005-04-27 Admonish is confirmed to play at Destruction Fest, London, 23 July. 2005-04-12 The Admonish EP entitled "Den Yttersta Tiden" was released yesterday at Club 666. 2005-02-13 Soundclips from the upcoming EP are available in the Music section. 2005-02-05 Admonish has been booked to play at Club 666, 11 April. 2005-02-05 The mixing of the upcoming 3-track EP is finished. Expect a release in Marsh. 2004-12-13 The new Admonish website is launched.